Bamboo is the fastest growing plant in the world. Some species can grow as much as 3 feet in 24 hours or 1 inch every 40 minutes. That gives the saying “like watching grass grow” a whole different meaning. 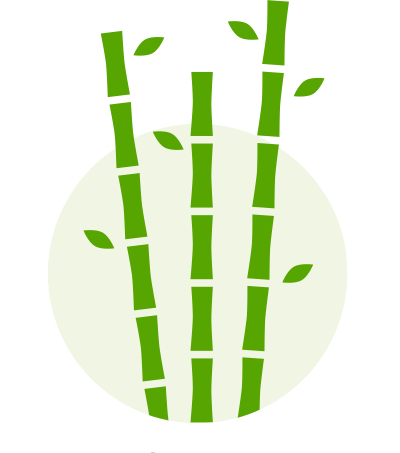 But growing really fast isn’t the only thing startups and bamboo have in common. Bamboo is a colony plant that shares a root system, and while it can grow really fast once established (like a forest’s worth in a month fast), it takes some time before it gets to that stage. In the first year after planting, only a few new bamboo shoots will grow. The year after, the new shoots that grow are more numerous and larger than the year before, with the plant having more energy from last year’s shoots. In about 4-5 years, the bamboo’s root system is fully established and it grows like crazy. Startups, by definition, grow really quickly. But in the beginning, that growth may seem insignificant. Growing from $100 to $1,000 in MRR over a year is a 10x increase, but no one’s going crazy over $900. Yet just like bamboo, startups can use that quick but small growth to fund future growth. Your first few customers are like that first shoot of bamboo, unimpressive on its own but setting the stage for crazy fast growth down the line. Something many people don’t realize, and even fewer people talk about, is that those first few years are not only a normal part of a startup’s life, they’re essential. That’s the time when you’re establishing your roots, finding product market fit and getting your first few key customers. It’s that strong base that allows for really impressive growth down the line. The stories you see about billion dollar startups often gloss over the first few years, where the company wasn’t that impressive. They skip to the more glamorous stage, with lots of venture funding or millions in revenue. If you take a look at so called unicorn startups, private companies with a valuation greater than a billion dollars, you can see a very clear trend. I put together a list of unicorn startups and how long it took them to get to a billion dollar valuation. A lot of these companies seem like they popped up out of nowhere and became huge overnight. While some of them did grow incredibly quickly, they’re the exception. 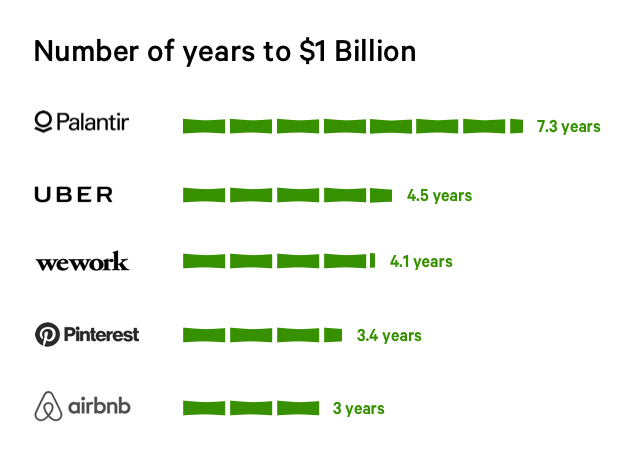 On average, it takes companies that reach a billion dollar valuation 7.5 years to get there. The fastest on the list was iCarbonX, a Chinese AI health data startup that took only 6 months after it was founded to get to a billion dollar valuation. On the other end is Otto Bock HealthCare, a German healthcare company that took a whopping 98 years to get to a billion. If we take a closer look at the 5 highest valued private US companies, there’s another trend - grow fast, worry about profit later. 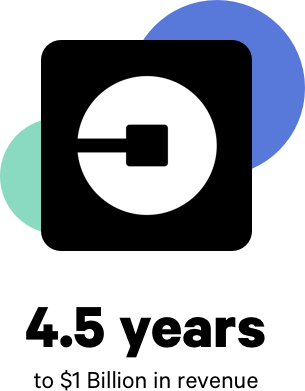 Uber was founded in 2009 and has received over $21 billion in funding, with most recent investments putting it at a $68 billion valuation. In those nearly 10 years of operations, Uber has yet to turn a profit. They have been pumping all their money into growth and they are getting closer to profitability now, but 10 years of losing money is not something every company can pull off. 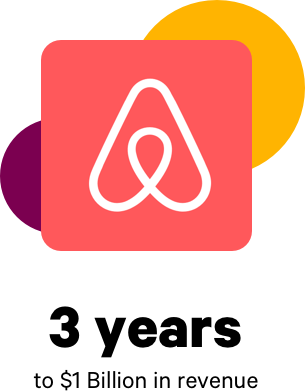 Airbnb was founded in 2008 and a bit less than 3 short years later, they were valued at over $1 billion. With a current valuation of around $30 billion, Airbnb is by far the most successful company to come out of YC (if we go by valuation). Unlike Uber, Airbnb is profitable. Their first profitable quarter was in 2016 and their first profitable year was 2017. 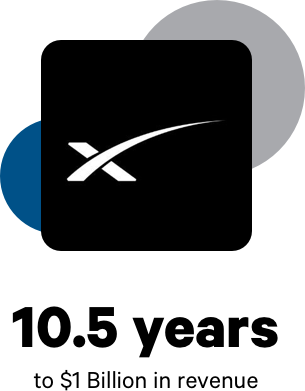 One of the older companies in the top 5, SpaceX was founded in 2002 and took over 10 years to get to a billion. SpaceX is a bit different than the others since what they do is extremely capital intensive. Launching a rocket isn’t cheap after all. They’ve had small profits in the past but in recent years they have been losing money. Rocket science R&D isn’t cheap and their very expensive assets blowing up on occasion definitely doesn’t help. But based on estimates by some experts, SpaceX most likely made a small profit in 2017 now that they’ve got the hang of landing rockets (still mind blowing, no matter how many times I say it). 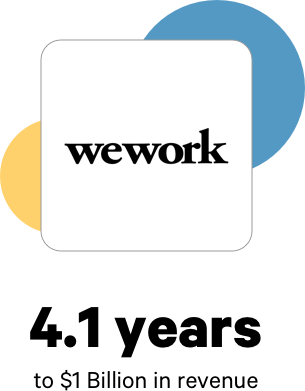 The co-working space giant was founded in 2010 and got to a billion relatively quickly. They’re selling a vision of the future where remote work and freelancing is much more prevalent, and many people seem to agree. But their high capital costs to set up buildings means they’re far from profitable - they lost close to $1 billion in 2017. This big data powerhouse was founded in 2004 and took about the average time of 7 years to reach $1 billion in valuation. Not much is known about their operations since they’re very secretive - contracts with the US Intelligence Community and Department of Defence will do that. They most likely had a profitable 2017 but that’s just speculation by analysts. All these companies took venture funding early and burned through it quickly. However, that’s not the only way to grow a company. Plenty of bootstrapped startups have managed to be successful and grow like crazy. It just takes even longer to get to that stage. Since there’s not as much data on bootstrapped companies as there is on funded ones, I just have a few anecdotes instead of a data set. As a note, these companies did raise funding eventually, but were bootstrapped for a long time before raising. Mailchimp was founded in 2000 and it was actually a side project for the team, which was working on an agency at the time. They built the product as a solution for some of their agency customers and kept it going as a side business. It wasn’t until 2007 that they started working on Mailchimp full time. But after that point, they grew really fast. By 2015, less than 10 years after going full time, they were at $280 million in annual revenue. Squarespace was founded in 2003 and was started as a personal project by the founder while he was still in school. He was the only employee for 4 years, until he reached $1 million in annual revenue in 2007. Since then, the company has raised $278 million, has 800 employees and is valued at $1.7 billion. SurveyMonkey was founded in 1999 and until 2009, it only had 12 employees. By 2012, they were doing $113 million in revenue and a $250 million round of funding in 2014 put them at a $2 billion valuation. Qualtrics was founded in 2002 by a father and son in their basement. They were bootstrapped for a long time, with most of their employees taking lower pay, and took until 2007 to get to $100K in MRR. In 2012, they turned down a $500 million acquisition offer when they were making $50 million a year. 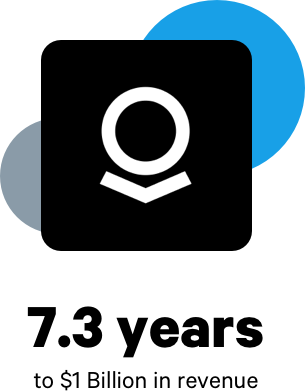 In 2017, they raised $180 million at a $2.5 billion valuation and were on track to make $250 million in revenue. These companies all grew really fast and eventually took funding, but many started as a side project. And even if they didn’t, they took a lot longer to get to a billion dollar valuation than companies that took venture funding right away. But, as a favourite saying of mine goes, the plural of anecdote is not data. These companies are the exception not the rule, they’re the ones that make the news. Most companies don’t grow that quickly, or ever reach a billion dollar valuation. To get a better view of things, I looked at data Josh Pigford from Baremetrics shared in a webinar recently. He analyzed how long it takes on average for companies to reach certain revenue milestones. And what the data showed was very interesting. 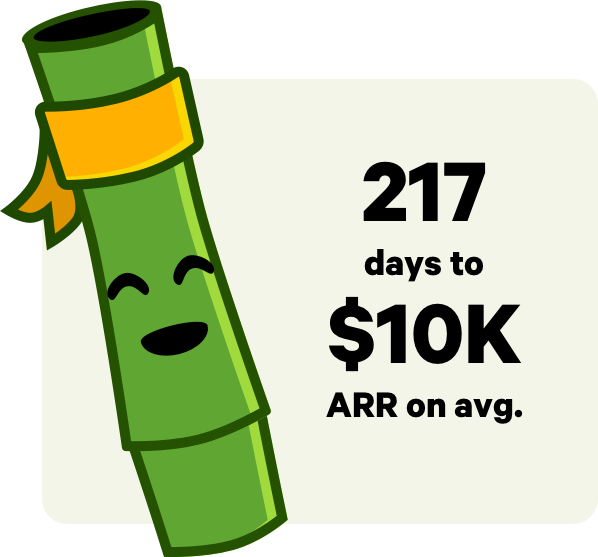 On average, companies take 217 days to get to $10K in ARR. That’s over 7 months to get to $800 per month. Getting the next $10k in ARR is a lot faster, taking only 59 more days. To get to $100K in ARR took on average 463 days from starting to charge. The next $100k took about one third of the time at 145 days. A similar pattern holds for $1M in ARR, taking 716 days on average. The next million, from $1M to $2M, takes only 225 days. Getting to that first milestone takes a really long time. Doubling it takes a lot less, usually about a third of the time. But that initial growth is still low in absolute terms. Most companies take over a year to be able to pay one person a full time salary from revenue. So if you’ve been working away on your company for 1 to 2 years and are just now starting to pick up momentum, don’t worry, you’re in good company. So go ahead and be like bamboo and use those wins that may feel small now to fuel explosive growth down the line. The companies that seem to be growing a forest overnight had to go through the exact same thing in the beginning.